In Anton Chekhov's sublime short story, "The Lady With the Dog," Dmitri Gurov pursues his love, Anna Sergeyevna, to her provincial Russian town and finds her with her balding husband at a performance of the operetta The Geisha. In Dezsö Kosztolányi's novel Skylark, the Vajkays, husband and wife, attend a Sárzeg performance of The Geisha. He is amused by the lyrics: "Happy Japan,/ Garden of glitter!/ Flower and fan/ Flutter and flitter . . ./ Merry little geishas we!/Come along at once and see/ Ample entertainment free,/ Given as you take your tea." 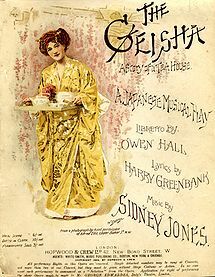 The Geisha (1896) is an actual operetta, a musical play really, by British composer Sidney Jones with Owen Hall and Harry Greenbank. It was inspired by Gilbert & Sullivan’s The Mikado and by the fad for all things oriental. Lieutenant Reginald Fairfax is enjoying a dalliance with the head geisha, Mimosa San, when his betrothed, Molly, arrives. The operetta included a song called “The Dear Little Jappy-Jap-Jappy”and another “Chin Chin Chinaman,” which may preclude it being performed any time soon. You can hear samples of both songs, if you dare, or buy the album at Amazon.